Last month's article featured Pitcher's Thistle - Cirsium pitcheri, a rare dune thistle that, until a few years ago, grew at the back edge of the dunes at Port Crescent State Park, near the tip of the Thumb. Fewer than about 20 plants managed to survive through the 1990s, dwindling to just 1 plant in 2002, and not to be found since. The nearest location is now probably on the west side of Saginaw Bay. Pitcher's Thistle is named for Dr. Zina Pitcher, who found the plant in the Grand Sable Dunes along Lake Superior when stationed at Fort Brady in Sault Sainte Marie as an Army surgeon from 1826-28. Like many early physicians, Pitcher was an accomplished botanist. Zina Pitcher was born in 1797 and came to Michigan from New York state. In 1822 he received a medical degree from Middlebury College in Vermont. Amos Eaton, a well-known scientist and teacher who lectured on botany across New England, was Pitcher's instructor. Pitcher was an Army surgeon for eight years in the Michigan territory, stationed at Fort Saginaw, Fort Brady in Sault Sainte Marie, and Fort Gratiot, north of the present city of Port Huron. Later, he was stationed in Arkansas, Oklahoma, and Virginia. 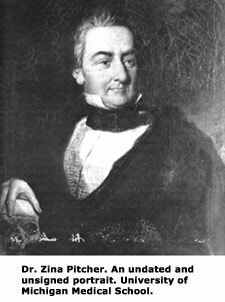 In 1836, after about 15 years as an Army surgeon, Dr. Pitcher resigned to practice medicine back in Detroit. He became a very prominent Michigan citizen. He helped organize the Historical Society of Michigan along with Lewis Cass and Henry Rowe Schoolcraft. He was appointed by the Governor to the Board of Regents of the University of Michigan where he founded the medical school and worked until the end of his life. Pitcher was the mayor of Detroit, then the capitol of Michigan, in 1840-41 and 1843. He was even a candidate for the Governor of Michigan in the Whig Party in 1843. Pitcher's mayoral term was interrupted in 1842 when Douglass Houghton served. Houghton, for whom a Michigan lake, city, county, and a goldenrod species are named, was also a botanist, physician, and the first state geologist of Michigan. He located copper deposits in the Keweenaw Peninsula that brought great wealth to the region. Houghton also studied with Amos Eaton in New York, as Pitcher had. Zina Pitcher was influential in bringing Houghton to Detroit from New York state as a science lecturer in 1830. As mayor of Detroit, Pitcher was the president of the Board of Education. He found that about two-thirds of Detroit's school-aged children were not attending school, many "creating a nuisance and engaging in mischief". Also, the Detroit schools were nearly closed for lack of funds. Mayor Pitcher and a pastor of the Holy Trinity church convened a public meeting. They asked the Michigan legislature to authorize a city tax for school funding, which passed, and by 1842, led to free public schools in Detroit for all children from ages 5 to 17. Dr. Pitcher seems to be partly responsible for establishing the first Homeopathic Medical College in Michigan, but not necessarily by his choosing. Like the majority of his colleagues, Dr. Pitcher was disturbed by the appearance of a few homeopathic physicians in Michigan. In order to prevent homeopathy from gaining popularity, he persuaded Senator Kibbee of Lenawee County to introduce a bill in the legislature in 1846, requiring all medical practitioners to be licensed, and otherwise guilty of a misdemeanor. Only those in good standing with the Michigan State Medical Society were to be licensed. The bill was hurried through the senate and sent to the house before supporters of homeopathy became aware. However, Dr. John Ellis, a leading homeopathist in Detroit, organized supporters and defeated the legislation at almost the last minute. In 1846, another revision of Michigan law allowed unlicensed physicians to collect fees, and admitted physicians from other states to practice without formality. Pitcher said of the Michigan Supreme Court decision that it effectively meant that a doctor is any person calling himself such. This decision basically eliminated the functions of the State Medical Society at a time when "cults, quacks, and patent medicines" were popular. Dr. Pitcher said, "The history of this society furnishes one evidence of a general truth, that the consent of the governed, in order to have any binding validity, must be an exposition of the popular sentiment, however erroneous that sentiment may be." Academic resistance to homeopathy continued for years, but inspired supporters of homeopathy to fight back, still organized because of Dr. Pitcher's 1846 bill. Eventually, in 1875, the Michigan legislature established by law a Homeopathic Medical College at the University of Michigan. The dominant medicine might not always have been the best alternative. David Ward, a medical student who later became a lumber baron, developed an inflammation around his lungs and was treated by Dr. Pitcher with "sever[e] counter-irritation on the chest by means of Spanish fly blisters, tartar emetic [induces vomiting] irritations, setons [threads inserted beneath the skin] to the right side and tartar emetic solutions taken internally three times daily." He recovered painfully. In those days, the availability of cadavers for medical study was controversial. Edmund Andrews studied medicine in Detroit with Zina Pitcher and was later a professor of anatomy and surgery in Chicago. Andrews wrote about his duties as a "resurrectionist," when he got bodies for Dr. Pitcher's classes. He wrote, "We hired a wicked man to dig up a dead soldier from the 'Potter's Field,' and over this subject the first anatomical lectures ever given in Detroit were delivered to us by Dr. Pitcher and Dr. Tripler in an upper room on Woodward Avenue near Congress Street." In 1856, Dr. Pitcher was president of the Michigan State Medical Society when the American Medical Association met in Detroit and elected him its 10th president. From 1857-61, Dr. Pitcher was the chief surgeon for the Marine Hospital in Detroit, located at Jefferson and Mount Elliot Avenues. Only sailors were admitted to the hospital, which was supported in part by a tax of 40 cents per month for each person employed on board any registered vessel. Any seaman who had been sailing for 3 months prior to admission was entitled to free care. Until his death, Dr. Pitcher was professor emeritus of obstetrics at the University of Michigan. He died on April 4, 1872, just 10 days short of his 75th birthday, and was buried at Elmwood Cemetery in Detroit. Some have said that probably Dr. Zina Pitcher was second only to Dr. William Beaumont in distinction among 19th-century Michigan physicians. For more on Dr. Zina Pitcher and other botanical pioneers of the Great Lakes region, I highly recommend Botanical Beachcombers and Explorers by Edward G. Voss, 1978, 100 pages, available from the University of Michigan Herbarium for only $11.50. Contact them at 734-764-2407, or see their web site at http://www.herbarium.lsa.umich.edu/.